In 1990, at the age of 27, Rachel Whiteread made Ghost, her breakthrough work, by casting in plaster the interior of a Victorian living room at 486 Archway Road in North London. In Whiteread’s words, Ghost causes the "viewer to become the wall." Approximately nine feet high, eleven and a half feet wide, and ten feet deep, Ghost is made of four tiers of stacked plaster panels bearing the impressions of the room’s interior surfaces, facing outward toward the viewer. A conceptual innovation, Ghost creates a positive room-sized object from a negative space. From this disorienting sculpture emerge recognizable forms of the fireplace (complete with soot), the textured grain of skirting boards, and the smooth surface of a window. 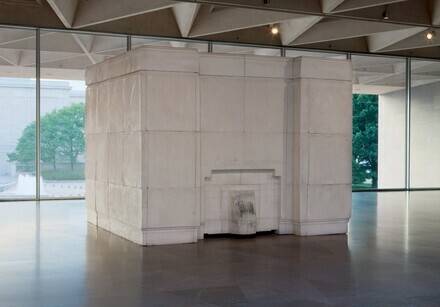 Whiteread wrote of her intent to "mummify the air in the room," an articulation of the memorial tones evoked by this quiet, mausoleum-like work. Whiteread’s remarkably consistent practice of indexing domestic spaces (rooms, staircases, a house), furniture (chairs, tables), and containers (bookcases, cardboard boxes) opens these life-casts, like Ghost, to new possibilities. By constantly returning to these forms, Whiteread’s compelling art ultimately gives shape to a new awareness of the changing phenomena of the everyday. She has worked on every scale, defining the space between positives and negatives, public and private, and manufactured and handmade objects, always with concision, intelligence, beauty, and power. Rachel Whiteread. Ghost, Chisenhale Gallery, London, 1990, unnumbered catalogue, repro. Rachel Whiteread, Arnolfini Gallery, Bristol, 1991. Rachel Whiteread, Stedelijk Van Abbemuseum, Eindhoven, 1992-1993, repro. Young British Artists. John Greenwood, Damien Hirst, Alex Landrum, Langlands & Bell, Rachel Whiteread. The Saatchi Collection, London, 1992, unnumbered catalogue, repro. Passagearbeten. Passageworks, Rooseum Centre for Contemporary Art, Malmö, Sweden, 1993. Rachel Whiteread, Palacio de Velázquez, Museo Nacional Centro de Arte Reina Sofia, Madrid, 1997, unnumbered catalogue, repro. Sensation: Young British Artists from the Saatchi Collection, Royal Academy of Arts, London; Neue Nationalgalerie im Hamburger Bahnhof, Berlin, 1997-1998, unnumbered catalogue, repro. Between Cinema and a Hard Place, Tate Modern, London, 2000, no. 22, repro. Blast to Freeze: British Art in the 20th Century, Kunstmuseum Wolfsburg; Les Abattoirs, Toulouse, 2002-2003, pl. 211. Gillick, Liam. Rachel Whiteread: Ghost. Exh. cat. Chisenhale Gallery, London, 1990. Saltz, Jerry. “Rachel Whiteread: Ghost.” CV: Journal of Art and Crafts vol. 3, no. 3 (September - November 1990): 18-19. Archer, Michael. “Ghost Meat.” Artscribe 87 (Summer 1991): 35-38. Feaver, William. “Breaking the Mould.” The Observer (24 November 1991): A67. Dorment, Richard. “Disturbing Symbols of Death.” The Telegraph (11 March 1992): 22. Chater, Peter, ed., and David Batchelor. Rachel Whiteread: Plaster Sculptures. Exh. cat. Luhring Augustine, New York; Karsten Schubert, London. New York: 1993: 6-8, 9, 10; repros. 24-27. Graham-Dixon, Andrew. “This is the House that Rachel Built.” The Independent (2 November 1993): 25. Hall, James. “I can't go on,but...” The Guardian (4 November 1993): A7. McEwen, John. “The House That Rachel Unbuilt.” The Sunday Telegraph (24 October 1993): 6. Meschede, Friedrich. Rachel Whiteread: Gouachen. Exh. cat. Deutsche Akademische Austauschdienst (DAAD) Gallery, Berlin. Stuttgart, 1993: 9, 12-14, 16, 17; repros. 10, 13, 14, 15. Roberts, Alison. “Turner's Best Equals the Worst.” The Times (24 November 1993): 1, 3. Shone, Richard. “Rachel Whiteread’s ‘House.’" The Burlington Magazine vol. 135, no. 1089 (December 1993): 837-838, esp. 838. Fairbrother, Trevor. “Whiteread’s Ghost.” Parkett no. 40/41 (2 June 1994): 90-93; repros. 91-93. Grunenberg, Christoph, et al. Rachel Whiteread: Skulpturen. Exh. cat. Kunsthalle Basel; Institute of Contemporary Art, Philadelphia; Institute of Contemporary Art, Boston. Basel, 1994: 21, 22, 24, and 25. Strickland, Carol. "Seven Women Artists Expand Limits of What Is 'Acceptable.'" The Christian Science Monitor; https://m.csmonitor.com/1994/0818/18111.html; published 18 August 1994; accessed 28 July 2017. Zelevansky, Lynn. “Sense and Sensibility: Women Artists and Minimalism in the Nineties.” MoMa no. 17 (Summer 1994): 14-16. Barnes, Rachel. “No More House Work with House.” The Guardian (8 April 1995): 28. Gale, Iain. “Cabinet Art: Jason & Rhoades.“ The Independent (15 August 1995): 10. Kimmelman, Michael. “Turning Things Inside Out.” The New York Times; http://www.nytimes.com/1995/02/05/arts/art-turning-things-inside-out.html?pagewanted=all; published 5 February 1995; accessed 16 December 2016. Lingwood, James, ed., et al. Rachel Whiteread: House. London, 1995: 121, 128, 157. Princenthal, Nancy. “All That Is Solid.” Art in America (July 1995): 52-57, esp. 56. Smith, Roberta. “Some British Moderns Seeking to Shock.” The New York Times; http://www.nytimes.com/1995/11/23/arts/art-review-some-british-moderns-seeking-to-shock.html; published 23 November 1995; accessed 28 July 2016. Temin, Christine. “Rachel Whiteread Brings Her Investigations to Boston.” Boston Globe (7 May 1995): 33. Batchelor, David. "Rachel Whiteread: Liverpool and Madrid." The Burlington Magazine vol. 138, no. 1125 (December 1996): 837-838. Bradley, Fiona, ed., et al. Rachel Whiteread: Shedding Life. Exh. cat. Tate Gallery Liverpool; Museo Nacional Centro de Arte Reina Sofia, Madrid. London, 1996: 12, 14, 64. 77, 80; repro. 15. Cousins, Mark. “Rachel Whiteread: Making Space Matter.” Tate: The Art Magazine 10 (Winter 1996): 32-36. Duval-Smith, Alex. “Paris 'Insulted' by British Art.” The Observer (16 June 1996): 21. Feaver, William. "A Century of British Sculpture." Art News vol. 95, no. 9 (Oct 1996): 147. Gayford, Martin. “Confusing for les rosbifs.” The Telegraph (12 June 1996): 23. Levy, Paul. “The Gallery: British Artists Teach French a Lesson.” The Wall Street Journal, Europe (28 June 1996): 11. Lewis, Jo Ann. “At the Hirshhorn, a New World Disorder.” The Washington Post (7 July 1996): G05. McEwen, John. “It's That Old Centennial Syndrome Again.” The Sunday Telegraph (6 October 1996): 9. Searle, Adrian. “No Stone Unturned.” The Guardian (25 June 1996): A10. Searle, Adrian. “World of Interiors.” The Guardian (17 September 1996): A10. Soulillou, Jacques. “L'architecte et le fantôme.” Revue d'esthétique vol. 29, no. 96 (1996): 75-81, esp. 76. Wilkin, Karen. "British Sculptors Invade Paris." The Hudson Review vol. 49, no. 3 (Autumn 1996): 457-462, esp. 461-462. Barwick, Sandra. “Rachel Whiteread.” The Telegraph (15 September 1997): 34. Benedict, David. “The Week in Review: The Exhibition Sensation.” The Independent (20 September 1997): 19. Cork, Richard. “The Establishment Clubbed.” The Times (16 September 1997): 16. Feaver, William. “Myra, Myra on the Wall...” The Observer (21 September 1997): 10. Feaver, William. "’Sensation.’" Art News vol. 96, no. 11 (December 1997): 173. Gallagher, Ann, ed., et al. Rachel Whiteread: British Pavilion XLVII Venice Biennale. Manchester, 1997: 30, repro. 57. Jobey, Liz. "A Rat Race?" The Guardian (4 October 1997): B28-B33; repro. B30. Jobey, Liz. “Tate Expectations.” The Guardian (10 February 1997): A12-A13. Long, Denny. “The Turner Prize.” The Guardian (11 October 1997): T78. Searle, Adrian. “Feeding Frenzy.” The Guardian (16 September 1997): A10-A11. Dault, Gary Michael. “Whiteread's Meteor Hits Art Gallery of Ontario.” The Globe and Mail (9 April 1998): C1. Iversen, Margaret. “In the Blind Field: Hopper and the Uncanny.” Art History vol. 21, no. 3 (September 1998): 409–429, esp. 409-410; repro. 410. MacRitchie, Lynn. “Rude Britannia.” Art in America vol. 86, no. 4 (April 1998): 37-39, esp. 38. Murphy, Anna. “Dinky Cars and Hats and Houses: They Used to Belong in the Nursery, Now You Find Them in Art Galleries.” The Observer (23 August 1998): 22. Barstow, David. “Documents Show Battle for Control of Exhibit.” Houston Chronicle (7 December 1999): 3D. Burton, Jane. “Concrete Poetry.” Art News (May 1999): 154-157, esp. 157. Cork, Richard. “Art Attacks.” Illustrated London News (6 December 1999): 60-65. Cruzvillegas, Abraham. “El Ojo Breve/ Juntos pero no revueltos.” Reforma (14 July 1999): 3. Danto, Arthur. “'Sensation' in Brooklyn.” The Nation vol. 269, no. 14 (1 November 1999): 25-29. Franceschetti, Roberta. “Whiteread riempie il vuoto: per dare corpo alla memoria.” Arte vol. 316 (December 1999): 60. Knight, Christopher. “In the End, It's Simply Misnamed.” Los Angeles Times (19 November 1999): 2. Madoff, Steven Henry. "Shock for Shock's Sake." Time vol. 154, no. 15; http://content.time.com/time/magazine/article/0,9171,992208,00.html; published 11 October 1999; accessed 28 December 2016. Pollack, Barbara. "Sensation." Art News vol. 98, no. 10 (November 1999): 190. Saltz, Jerry. “Material Girl.” The Village Voice (16 November 1999): 79. Storr, Robert. “Remains of the Day.” Art in America vol. 87, no. 4 (April 1999): 104-109, 154, esp. 106-107; repro. 106. Sylvester, David. “Carving Spaces.” Tate: The Art Magazine vol. 17 (Spring 1999): 40-47, esp. 42. Temin, Christine. "'Sensation' Isn’t so Much of One.” Boston Globe (24 November 1999): C1. Barber, Lynn. “Art Struck.” The Observer (19 March 2000): H5-H6. Dorment, Richard. “A Brutal Fact of Life in the City of Dreams.” The Telegraph (27 October 2000): 26. Pops, Martin. "Three Exhibitions." Salmagundi no. 128/129 (Fall 2000 - Winter 2001): 16-41, esp. 23; repro. 22. Potts, Alex. The Sculptural Imagination: Figurative, Modernist, Minimalist. New Haven and London, 2000: 360; repro. 360. Rice, Robin. Review of Rachel Whiteread by Christoph Gruenberg and Rachel Whiteread: Shedding Life by Fiona Bradley et al. Woman’s Art Journal vol. 21, no. 1 (Spring 2000): 59-60. Searle, Adrian. “Making Memories.” The Guardian (17 October 2000): A12. Shone, Richard. "'Ant Noises' and 'Outthere.'" The Burlington Magazine vol. 142, no. 1168 (July 2000): 455-56, esp. 455. Aidin, Rose. “A Sculptor Who Casts a Long Shadow: Rachel Whiteread talks to Rose Aidin.” The Sunday Telegraph (17 June 2001): 5. Cork, Richard. “Space Craft” The Times (2 June 2001): 23. Corrin, Lisa G., Patrick Elliott, and Andrea Schlieker. Rachel Whiteread. Exh. cat. Seprentine Gallery, London; Scottish National Gallery of Modern Art, Edinburgh. London and Edinburgh, 2001: 7, 9, 11, 13, 59; repro. 8. Daily, Meghan, ed., et al. Rachel Whiteread: Transient Spaces. Exh. cat. Deutsche Guggenheim, Berlin: 21, 52-53. 62, 71-72, 73, 82-83, 133; repro. 53. Denny, Ned. “Spaced Out.” New Statesman vol. 14, no. 664 (Jul 9, 2001): 41. Gale, Iain. “Upstairs at Rachel's.” Scotland on Sunday (30 September 2001): 4. Lubbock, Tom. “A Matter of Absence.” The Independent (3 July 2001): 11. Muir, Robin. “Rachel Whiteread.” The Independent Magazine (26 May 2001): 15, 16, 20. Mullins, Charlotte. “Exposed: The Space Beneath the Stairs.” The Independent (17 June 2001): 10. Mullins, Charlotte. Rachel Whiteread. London, 2004: 23-4, 26, 39, 48, 49, 50, 52, 61, 104, 110, 119, 122; repro. 16. Fernie, Jes. “Impossible Dreams.” Building Design (5 July 2002): 14-15. Gleadell, Colin. “Contemporary Market.” The Telegraph (30 September 2002): 20. Irving, Mark. “Inner Space, the Final Frontier,” Financial Times (7/8 December 2002): 12. Nairne, Sandy. “Rachel Whiteread.” Art Now: Interviews with Modern Artists. (London and New York, 2002): 46 - 59, esp. 51, 52; repro. 53. Schneider, Christiane, ed., and Susanna Greeves. Rachel Whiteread Exh. cat. Haunch of Venison, London. London, 2002: 26, 28, 38; repro. 25. Wahjudi, Claudia. “Rachel Whiteread: Transient Spaces.” Kunstforum International vol. 158 (January 2002): 281-282. Beechey, James. "Blast to Freeze. Toulouse." The Burlington Magazine vol. 145, no. 1202 (May 2003): 392-94. Brooke, Stephen. "Memory and Modernity." Journal of British Studies vol. 42, no. 1 (January 2003): 132-139. Cork, Richard. Breaking Down the Barriers: Art in the 1990s. New Haven, 2003: 33, 179. Cork, Richard. “Inside-Out Nightmare.” The Times (17 December 2003): 16. Ferris, Alison. "Disembodied Spirits: Spirit Photography and Rachel Whiteread's 'Ghost.'" Art Journal vol. 62, no. 3 (Fall 2003): 45-55; esp. 48, 50-52; repro. 51. Grant, Simon. "'My Biggest Fear? A Place Where There Are No Walls at All.'" The Independent on Sunday (16 November 2003): 7. Hedlin Hayden, Malin. "Out of Minimalism: The Referential Cube; Contextualizing Sculptures by Anthony Gormley, Anish Kapoor, and Rachel Whiteread." Ph.D. diss., Uppsala Universitet (2003): 102, 104, 243. Baker, Kenneth. “Touching the Void -- Empty Spaces are Artist's Blank Slate.” San Francisco Chronicle (6 May 2004): E1. Cole, Ina. “Mapping Traces.” Sculpture Magazine (April 2004): 36-42, esp. 38. Darwent, Charles. “Can You Tell What It Is Yet? No? Good.” The Independent on Sunday (9 May 2004): 17. Darwent, Charles. “Simply Streets Ahead of the Rest; Michael Landy: Semi-Detached Tate Britain.” The Independent on Sunday (23 May 2004): 16-17. Richard, Paul. "In the Anti-Room, No One's Home." The Washington Post (8 November 2004): C1, C8. Searle, Adrian. “Riddle of the Sands." The Guardian; https://www.theguardian.com/culture/2004/may/11/1; published 11 May 2004; accessed 28 July 2017. Sweet, Matthew. “Rachel Whiteread: Model Artist.” The Independent (11 December 2004): 12, 13, 15, 16, esp. 12. Townsend, Chris, ed., et al. The Art of Rachel Whiteread. London, 2004: 10, 17, 21-22, 24-25, 51, 53, 70-71, 74, 84, 87, 116, 184; repros. 54, 86. Vogel, Carol. “Another Round for Saatchi vs. Tate.” The New York Times; http://www.nytimes.com/2004/11/27/arts/design/another-round-for-saatchi-vs-tate.html; published 27 November 2004; accessed 28 December 2016. Vogel, Carol. “Inside Art: Wandering Room Finds a Home.” The New York Times (15 October 2004): E31. Akbar, Arifa. "Head Made of Blood Sold by Saatchi for Profit of Pounds 1,487,000." The Independent (21 April 2005): 18. Brooks, Xan. “The Guardian Profile: Rachel Whiteread.” The Guardian; https://www.theguardian.com/artanddesign/2005/oct/07/art; published 7 October 2005, accessed 28 December 2016. Burn, Gordon. “I Want It, I Want It All, and I Want It Now: Charles Saatchi Sells Part of His Art Collection at Christie's Tomorrow.” The Guardian (7 October 1998): B2-B3. Burn, Gordon. “So Rachel Whiteread, What’s With the Boxes?” The Guardian (11 October 2005): 8-11, esp. 10. Jones, Jonathan. “A Tale of Two Cities.” The Guardian (6 October 2005): 14. Potts, Alex. Rachel Whiteread: Sculpture. Exh. cat. Gagosian Gallery, London, 2005. Schneider, Eckhard, ed. Rachel Whiteread: Walls, Doors, Floors, and Stairs. Exh. cat. Kunsthaus Bregenz, 2005: 7-8, 70, 96, repros. 96, 110. Sutcliffe, Thomas. “What's in a name? Quite a lot.” The Independent (14 October 2005): 5. Vine, Sarah. “I don't get all modern art, so why should you?” The Times (13 May 2005): 6. Batchelor, David, and Mario Codognato. Rachel Whiteread. Exh. cat. Museo d’Arte Contemporanea Donnaregina, Naples, 2007: 17, 57; repros. 28-29. Duguid, Hannah. “Sculptures of People Who Aren’t There.” The Independent (11 May 2007): 1. Luke, Ben. “Whiteread Casts Off Her Past.” The Telegraph (23 June 2007): 12. Wullschlager, Jackie. “The Shape of Things.” Financial Times; https://www.ft.com/content/7e656524-a6be-11db-83e4-0000779e2340; published 19 January 2007; accessed 31 July 2017. Carley, Rachel. “Domestic Afterlives: Rachel Whiteread's Ghost.” Architectural Design vol. 78, no. 3 (2008): 26-29. Hattenstone, Simon. “Ghosts of Childhood Past.” The Guardian; https://www.theguardian.com/artanddesign/2008/may/10/art.culture; published 9 May 2008; accessed 28 December 2016. Lawrence, James. Rachel Whiteread. Exh. cat. Gagosian Gallery, Beverly Hills, 2008: 12. Luke, Ben. “Rachel Whiteread: Ghost Town.” Art World vol. 3 (February/March 2008): 52-59. Ollman, Leah. “Casting Form and Intimacy.” Los Angeles Times (14 November 2008): E22. Rosenberg, Karen. “Hidden Corners of the Neighborhood.” The New York Times (17 October 2008): C33. Smee, Sebastian. “Missed Opportunity from a Master of Empty Space.” Boston Globe (17 October 2008): D6. Pindar, Ian. "Gloom, Not Doom.” The Guardian (25 April 2009): 8. Curiger, Bice, and Rachel Whiteread. "In the Studio: Rachel Whiteread." Tate Etc. 20 (Autumn 2010): 60-69, esp. 62. Donovan, Molly and Rachel Whiteread. “Diamonstein-Spielvogel Lecture Series: Rachel Whiteread.” http://www.nga.gov/content/ngaweb/audio-video/diamonstein-spielvogel/diamonstein-spielvogel-whiteread.html. National Gallery of Art, Washington, 12 October 2008; released 20 July 2010; accessed 18 December 2016. Hodge, Brooke. “Seeing Things: Welling and Whiteread in L.A.” T Magazine; http://tmagazine.blogs.nytimes.com/2010/02/04/seeing-things-welling-and-whiteread-in-la/; published 4 February 2010; accessed 7 October 2016. Lawrence, James. “A Substitute for History: The Origins and Exhibition of Rachel Whiteread's 'Untitled (Room 101),' 2003.” The Burlington Magazine vol. 152, no. 1292 (November 2010): 736-743, esp. 739-740; repro. 741. Muchnic, Suzanne. “Inside Rachel Whiteread’s Drawing Room.” Los Angeles Times; http://articles.latimes.com/2010/feb/07/entertainment/la-ca-whiteread7-2010feb07; published 7 February 2010; accessed 9 October 2016. Searle, Adrian. “Rachel Whiteread: Through the Eyes of a Child.” The Guardian; https://www.theguardian.com/artanddesign/2010/sep/06/rachel-whiteread-tate-drawings; published 6 September 2010; accessed 28 July 2017. Walsh, John. “Rachel Whiteread: 'I've done the same thing over and over. '” The Independent; http://www.independent.co.uk/arts-entertainment/art/features/rachel-whiteread-ive-done-the-same-thing-over-and-over-2068718.html; published 3 September 2010; acccessed 5 October 2016. Cv / Visual Arts Research. "Rachel Whiteread" in Interview-Artists: Patterns of Experience, Recordings 1988-2011. London, 2011, 265-266. Johnson, Melissa. "Rachel Whiteread: Drawings by Allegra Pesenti." Woman's Art Journal vol. 32, no. 2 (Fall/Winter 2011): 56-57; repro. of drawing study 56. Sinclair, Iain. “Lights Out for the Territory," in Ruins, edited by Brian Dillon. London and Cambridge, 2011: 156-158, esp. 157. Spence, Rachel. “Gilding among the Grime.” Financial Times; https://www.ft.com/content/544d6c0a-519f-11e1-a9d7-00144feabdc0; published 11 February 2011; accessed 28 July 2017. Wilson, Emma. “Museum Spaces in Palliative Art: Mariana Otero's 'Histoire d'un secret.'" L'Esprit Créateur vol. 51, no. 1 (Spring 2011): 112-124, esp. 120-121. Cooke, Rachel. “Rachel Whiteread: ‘I Couldn’t Say No. It Felt Right to Do This One.’” The Observer; http://www.guardian.co.uk/uk/2012/jul/07/rachel-whiteread-whitechapel-art-interview?newsfeed=true; published 7 July 2012, accessed 1 October 2016. Forty, Simon. Concrete and Culture. London, 2012: 217. Jones, Jonathan. “Rachel Whiteread is Britain's Greatest Living Artist.” The Guardian; https://www.theguardian.com/artanddesign/jonathanjonesblog/2012/dec/14/rachel-whiteread-greatest-british-artist; published 14 December 2012; accessed 9 October 2016.
https://www.theguardian.com/artanddesign/2012/jun/12/rachel-whiteread-whitechapel-gallery; published 12 June 2012; accessed 28 December 2016. Luke, Ben. “Glitzing the Gallery.” Evening Standard (31 May 2012): 52. Pritchard, Stephen. “For the Record.” The Observer (22 July 2012): 36. "Rachel Whiteread Print – ‘Installation of Ghost 1990-2012. '” New Art Editions; http://www.newarteditions.com/rachel-whiteread-print-installation-of-ghost-1990-2012-chisenhale-gallery/; published 10 October 2012; accessed 22 November 2016. Whiteread, Rachel. "My Big Art Inspiration: Rachel Whiteread on Piero della Francesca.” The Guardian; https://www.theguardian.com/artanddesign/2012/oct/10/frieze-2012-big-art-inspiration; published 10 October 2012; accessed 28 December 2016. Wilson, Emma. "Mother" in Love, Mortality, and the Moving Image. London, 2012: 41-62, 163-165, esp. 59-60. Haavik-MacKinnon, Amy. “A Colony Within: Art and Identity in London's East End since World War II.” Ph. D. diss., Bryn Mawr College, 2013: 12, 99, 131, 143, 208. Hamilton, Adrian. “A Lesson in How to Think Inside the Box.” The Independent (15 April 2013): 40. Searle, Adrian. "Journey Through London Subculture is a Ragbag Bursting with Life." The Guardian; https://www.theguardian.com/culture/2013/sep/12/journey-london-subculture-fascinating-ragbag; published 12 September 2013; accessed 28 December 2016. Warde-Aldam, Digby. “Ghost House.” Apollo; http://www.apollo-magazine.com/house/; published 25 October 2013; accessed 10 October 2016.
https://www.theguardian.com/artanddesign/2013/apr/06/rachel-whiteread-life-in-art; published 6 April 2013; accessed 31 July 2017. Tan, Adele. “From Political Travesties to Aesthetic Justice: The Ugly in Teo Eng Seng’s D Cells," in Ugliness: The Non-Beautiful in Art and Theory, edited by Andrei Pop and Mechtild Widrich. London and New York, 2014: 141-180, esp. 160-162. Gebremedhin, Thomas. “Q&A With Artist Rachel Whiteread.” The Wall Street Journal; https://www.wsj.com/articles/q-a-with-artist-rachel-whiteread-1446750543; published 5 November 2015; accessed 18 December 2016. Gebremedhin, Thomas. “Q & A with Artist Rachel Whiteread.” Wall Street Journal; https://www.wsj.com/articles/q-a-with-artist-rachel-whiteread-1446750543; published 5 November 2015; accessed 28 July 2017. Rimell, Victoria. The Closure of Space in Roman Poetics. Cambridge, England, 2015: 150-151. Bowring, Jacky. Melancholy and the Landscape: Locating Sadness, Memory, and Reflection in the Landscape. New York, 2016: 78. Wong, Peter L. “Casting Call: Spatial Impressions in the Work of Rachel Whiteread.” The Plan Journal (2016): 97-110; repros. 97, 100, 101.